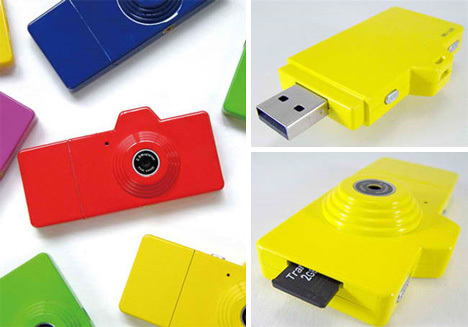 Out of the millions of weird flash drive cases out there, this one might be the most useful. This flash drive doubles as an adorable miniature digital camera, letting you take pictures and store your important data with one pocket-sized gadget. The pictures themselves are actually stored on a micro SC card that fits into a slot on the camera opposite the USB plug. At a mere 3.1 megapixels, this is obviously not the gadget for a serious photographer who is looking for a pocket cam. But for gadget lovers who find it impossible to pass up adorable little gizmos that exist for the sole purpose of being adorable, the Fuuvi Pick is sort of perfect. See more in Camera & Video or under Gadgets. April, 2011.